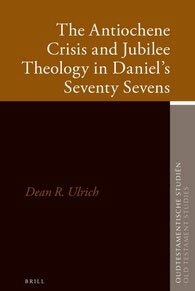 In The Antiochene Crisis and Jubilee Theology in Daniel’s Seventy Sevens, Dean R. Ulrich explores the joint interest of Daniel 9:24-27 in the Antiochene crisis of the second century B.C.E. and the jubilee theology conveyed by the prophecy’s structure. This study is necessary because previous scholarship, though recognizing the jubilee structure of the seventy sevens, has not sufficiently made the connection between jubilee and the six objectives of Daniel 9:24. Previous scholarship also has not adequately related the book’s interest in Antiochus IV to the hope of jubilee, which involves the full inheritance that God has promised to his people but that they had lost because of their compromises with Antiochus IV.